The Sa-Matra (meaning Great Trophy in the Ur-Quan language) is the name given to the awesome Precursor Battleship discovered by the Ur-Quan Kzer-Za thousands of years ago. It is the very symbol of Ur-Quan dominance; a virtually invincible war machine that guarantees that the Ur-Quan species will never need know fear of anything. The battleship is the coveted prize given to the victor of the Ur-Quan Doctrinal Conflict. Its destruction is the only way to stop either Ur-Quan faction from dominating the galaxy. According to the Melnorme historical records, after the era of the Dnyarri Slave Empire, the Ur-Quan species was thrown into ideological chaos with neither side in the debate willing to budge. The ensuing bloody civil war would have continued for decades and probably resulted in mutual annihilation had the Kzer-Za not happened upon an enormous Precursor Battleship. With the Precursor battle platform, the Kzer-Za were able to slice through the Kohr-Ah forces. In a matter of days the first Doctrinal Conflict was over with the Kzer-Za as victors. Though psychologically traumatized, the Kzer-Za were humble in their victory and admitted to the possibility that they were wrong and the Kohr-Ah right. Therefore the Kzer-Za let the remaining Kohr-Ah armada live and directed the Kohr-Ah to travel anti-spinward while the Kzer-Za travelled spinward around the galaxy. They agreed that when the two races met again, after travelling their separate ways, the ritual war — now known as the Doctrinal Conflict — would be refought, and the Precursor Battleship would go to the next winner. They accordingly named the battleship "Sa-Matra" (meaning "Great Trophy") in the Ur-Quan language, the winning side being promised possession of the ultimate weapon and therefore a decisive advantage in implementing their doctrine of control. A different (and less reliable) source, the neo-Dnyarri, claims that the Dnyarri had discovered the battleship and that Ur-Quan had taken it from them. He also states that the Ur-Quan used the Sa-Matra to destroy and subjugate the Dnyarri. Since this history is given in an account of the Ur-Quan and the Sentient Milieu that contradicts all other sources (including the neo-Dnyarri's own line before confusing the Ur-Quan at the Sa-Matra, "I sense the presence of my ancient slaves"), the credibility of this story is also called into question. Most recently, it was employed against the Alliance of Free Stars at the end of their war with the Ur-Quan Kzer-Za and their Hierarchy of Battle Thralls. Although up to that point the Alliance had been capable of holding Hierarchy forces at bay, the Sa-Matra proved to be an unanswerable weapon. It quickly broke the Chenjesu/Mmrnmhrm lines, incinerating conventional vessels at far beyond their own weapons' ranges; with the fall of those two races, the Alliance quickly surrendered. Chenjesu strategists of the time wondered why the Kzer-Za did not use the Sa-Matra sooner. Given that it holds such symbolic, ritual significance for the Kzer-Za, they probably sought to minimize its use as a matter of respect and honor. They therefore only brought it into play to break the Alliance's most powerful defenses, the technologically advanced Broodhome and Transformer ships. 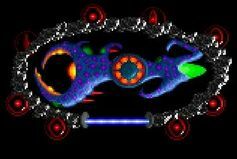 The events of Star Control II take place during the second Doctrinal Conflict; in order to prevent further devastation and to end the Ur-Quan hegemony for good, the New Alliance of Free Stars undertook a desperate gambit to destroy the Sa-Matra. After foraging the sector for information, they finally gained all they needed to locate the Sa-Matra, deactivated at the time and located in orbit around Delta Crateris V. The Alliance was also able to harness the power of the Dnyarri in the form of a reverted Talking Pet in order to penetrate the Ur-Quan defenses around the Sa-Matra. However, even the most powerful Alliance ships, the new Chmmr Avatar vessels were at insurmountable odds against the defenses of Sa-Matra and their escorts; however, the unmatched piloting skills of Pkunk and Yehat reinforcements, arriving at the last minute after the successful Yehat Revolution, fortunately proved very effective at disabling the Sa-Matra's defenses. Physically the vessel was huge, almost the size of a small moon, with numerous weapons and defensive systems mounted on protuberances across the surface. Its armor was built by unknown Precursor methods and was extremely strong, strong enough to withstand impacts and energy blasts capable of vaporizing similar quantities of normal matter — the Utwig Bomb, a device created by the Precursors to destroy moons and rearrange planetary continents, was not powerful enough to destroy it without augmentation. Additionally, the Ur-Quan kept it safe when not in use by using their own technology to build a shell of fused asteroids reinforced by a weak stasis field around it, rendering the surface inaccessible to any attacker. The one weakness of defense was a single access port in the Ur-Quan's asteroid shield. However, the access port was protected by a deadly force shield whose eight generators were externally embedded in the asteroid shell. These fortifications were further complemented by the Sa-Matra's active defense mechanisms, either added by the Ur-Quan Kzer-Za or initially built into the battleship by the Precursors. The observed active defense systems consisted primarily of energetic projectiles given quasi-intelligent tracking capabilities that surrounded and defended the main platform. The battle platform was capable of regenerating these projectiles as long as any of the generators were active, and even with all generators disabled, the projectiles were self-sustaining until disrupted by enemy fire. It is unknown how or why the shield generators and the Sa-Matra's active defenses were linked in this manner. The observed active defenses consisted of two types: a slow-moving green projectile that, upon contact with an enemy vessel, automatically discharged a powerful repulsive blast, and a highly-mobile cohesive collection of superheated plasma that could directly damage enemy ships with heat and impact.2 Weapon fire could disrupt these defenses, but their ability to track enemy vessels quickly and effortlessly and to be regenerated rapidly by the Sa-Matra made them fearsome obstacles to invaders. As for the Sa-Matra's main assault weapons, there was little chance to observe them as they were only in use during active aggression by the Ur-Quan and immediately prior to the Sa-Matra's destruction. The close range assault weapons, comprising many different types of projectors and cannons, inflicted massive damage even in the short time it took for The Flagship to come up alongside the Sa-Matra and detonate itself.3 What sketchy records we have of the Alliance's struggles against the Sa-Matra in the Ur-Quan Slave War suggest it was more than the equal of any fleet in direct combat and could easily have laid waste to large ground areas. The Chmmr do mention one of the Sa-Matra's deadliest armaments, the "annihilation toroids," which could vaporize ships from the far side of a solar system or cut broad swaths of devastation across a planet in seconds, possibly a reference to either the plasma-based active defense weapon or a more powerful version of the same weapon. 1In the PC ending sequence (by Accolade Studios), Talana relates that "following the destruction of the Sa-Matra battle platform the fleets of the Ur-Quan and the Kohr-Ah had fallen into chaos and had been vanquished by Chmmr forces and allied starships." Whereas, in the 3DO ending sequence, she relates that "the remnants of the Ur-Quan and Kohr-Ah fleet were high-tailing it for the Clouds of Magellan." 2No name is ever given in-game for these. In the source code, they are referred to as "Sentinels" and "Comets." 3The assault weapons attack on The Flagship is only seen in the ending cinematics of the 3DO version. This page was last edited on 15 October 2012, at 19:59.